Play Dragon Nest. Join The Escapist Guild. Win Over $3000 in Prizes! An enchanted world. Hope struggles against darkness. Fate lies with YOU. Welcome to Dragon Nest - Nexon's latest free-to-play fantasy MMORPG. You're about to enter a fantastic world filled with magic, wonder, hideous monsters, evil villains, and endless adventure. 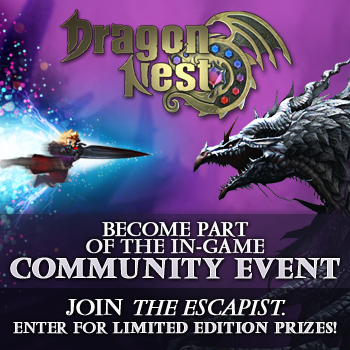 Playing Dragon Nest is so much fun that The Escapist Staff has created an in-game guild for the community and is inviting everyone to join. Nexon has also sweetened the pot by providing 5 limited edition Dragon Nest branded plush poochums to give away, plus six Amazon Gift Cards!! Our goal in-game is to have the largest guild on the server, so let's see what we can do! Staff members Nasrin, s0osleepie, Encaen and more will be in-game between 12pm to 5pm EDT, Wednesday through Friday this week to hang out with the community and help spread the destruction. For full information, click here to visit our official event page! Please Note: The game is available to play in the US, Canada, and Oceania ONLY.